Travel Supermarket has a new guide up, Insider guide: Eat out in London for less featuring my recommendation for Brasserie Zedel, Corbin and King's Picadilly brasserie, which is remarkably cheap for its location. I'll have to get back there with pen and camera as it needs a write up. Tom Aikens Restaurant is now closed. 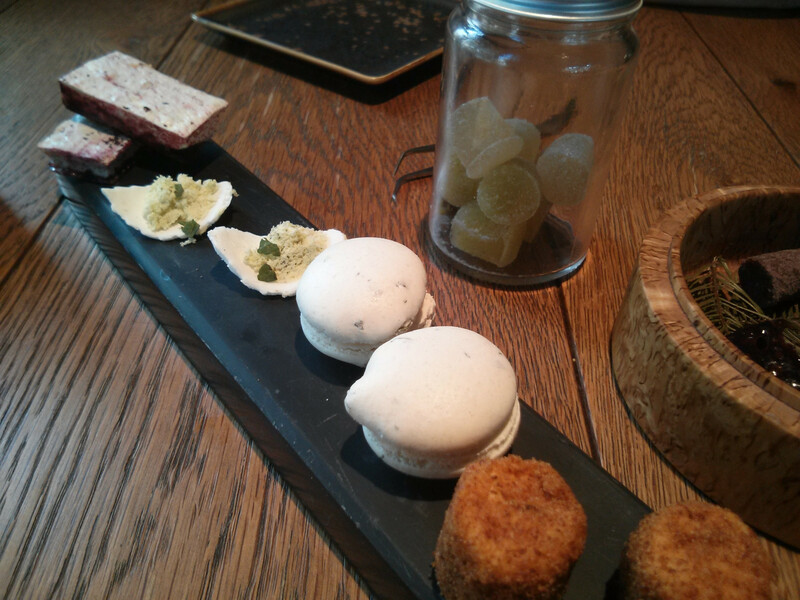 Having enjoyed the look and sound of Tom's food in the last few seasons of Great British Menu I was glad to be able to combine an afternoon visit to the V&A Museum with lunch at Tom Aikens Restaurant, his eponymous restaurant based in Chelsea. The room is spacious and smart, kitted out in wood and dark walls and large tables. Menus come in envelopes and rolled into scrolls, with a wine menu being pasted into an old French book about wine, a very cool touch. 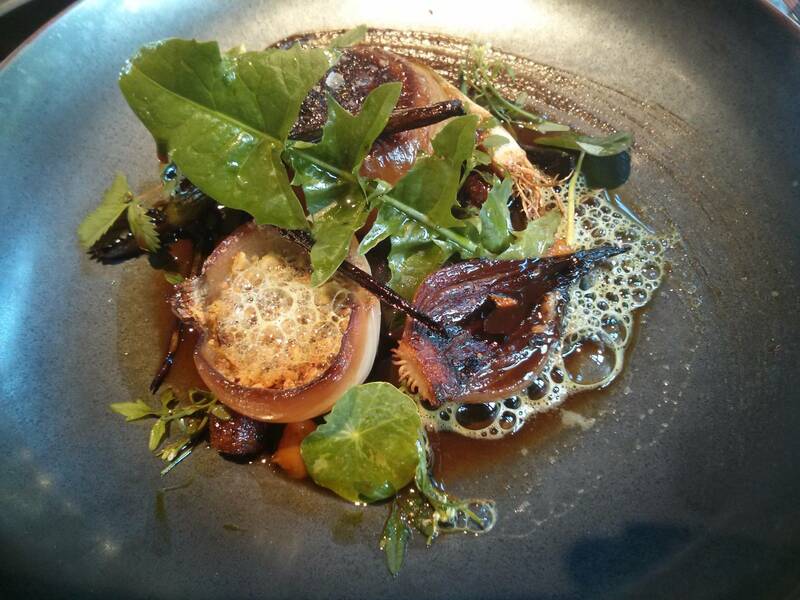 A lunch set menu, vegetarian and standard tasting and a la carte menus are available. 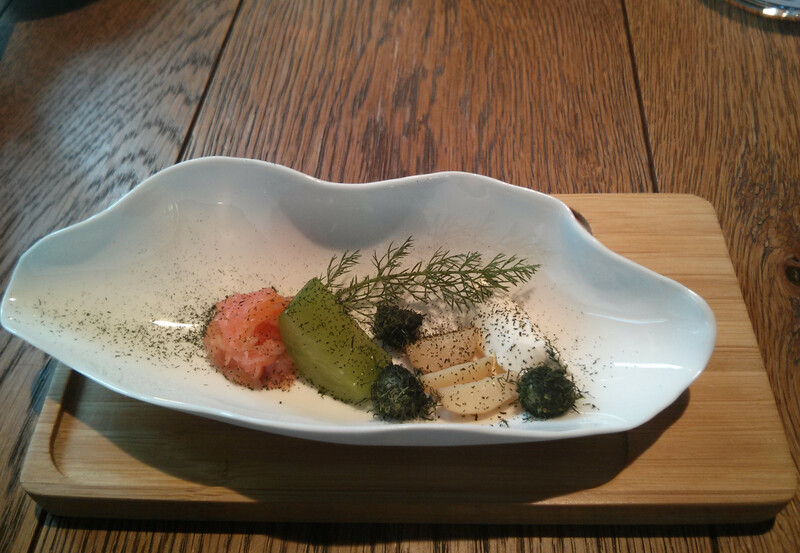 An amuse bouche was offered when we were browsing menus, for me a bowl with smoked salmon, cucumber, a tiny quenelle of cream cheese, dill and miniature quarters of a smoked new potato. 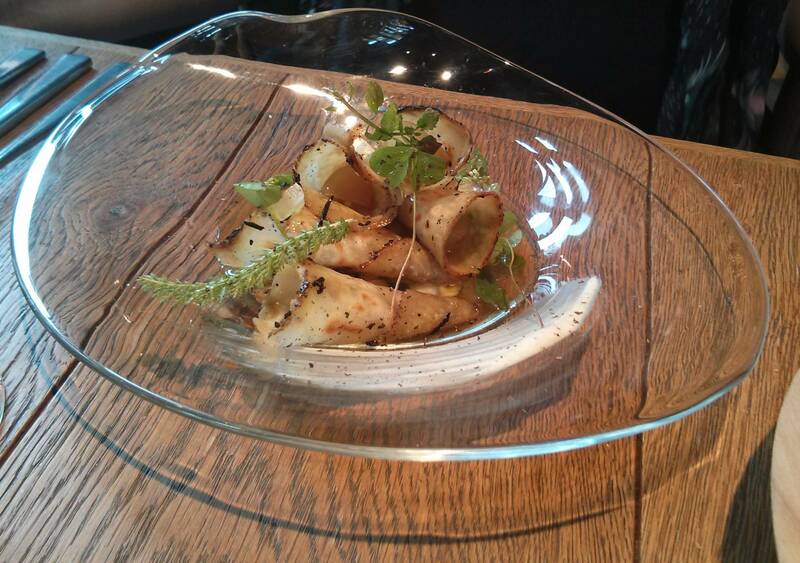 The salmon and cucumbers were excellent, but the cheese and smoked potato were the stand out elements, delicious. My wife's featured dried tomatoes, black olive, pine nuts, nasturtium, and some powder, which may have been tomato, olives and maltodextrin, which forms a melt in the mouth texture like sherbet or cornflour. 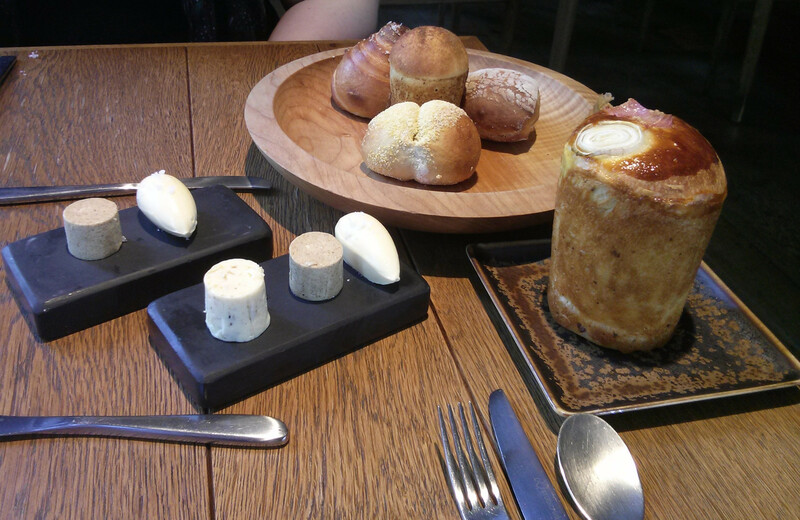 Bread was excellent, a very generous bowl of rolls and a separate plate with a huge bacon and onion brioche, with a slate with quenelles of bacon and onion butter, cep butter and plain butter. It must be noted the excellent attention to detail with regards to vegetarians, the butter selection with the bacon butter and the bacon brioche were provided on separate plates. The brioche was as good as the one at Ramsay a few days earlier, incredibly light and fluffy, but raised to new heights with the utterly fantastic cep butter, one of the best butters I've had a long time, with a deep cep flavour. My first course was Eggs and Bacon. 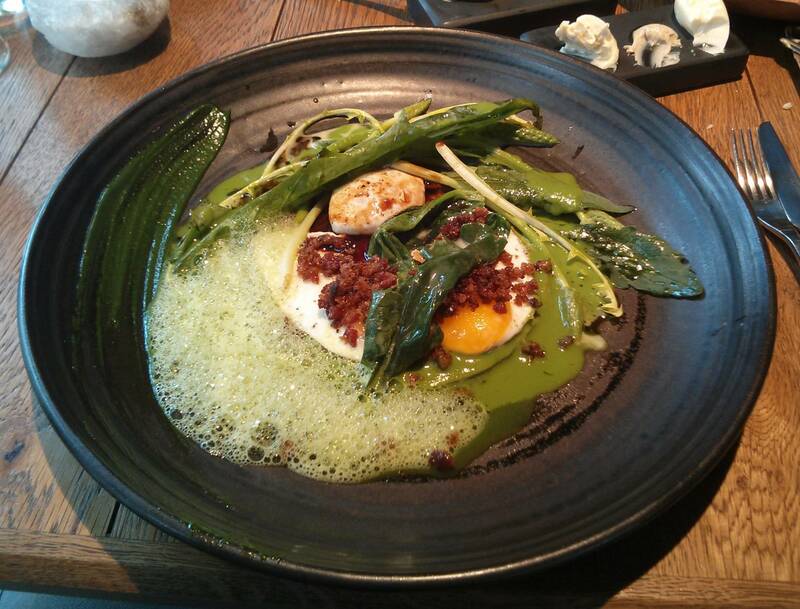 This was typical of Tom's complex dishes, featuring many elements and included 2 fried pheasant eggs and a poached egg, wild garlic, chervil, dandelion, and other foraged leaves I couldn't identify, nettle sauce, bacon and brioche crumbs. The eggs, bacon and greens were excellent, and there was a lovely fennel set puree of sorts under the eggs adding a buttery aniseed note which was really good. My wife had a glass bowl with cones of char grilled and baked celeriac with grapes inside, with some truffled creme fraiche and an apple and celeriac consomme poured at the table. I tried some celeriac and consomme, and had some lovely fragrant flavours and a fresh crunch. 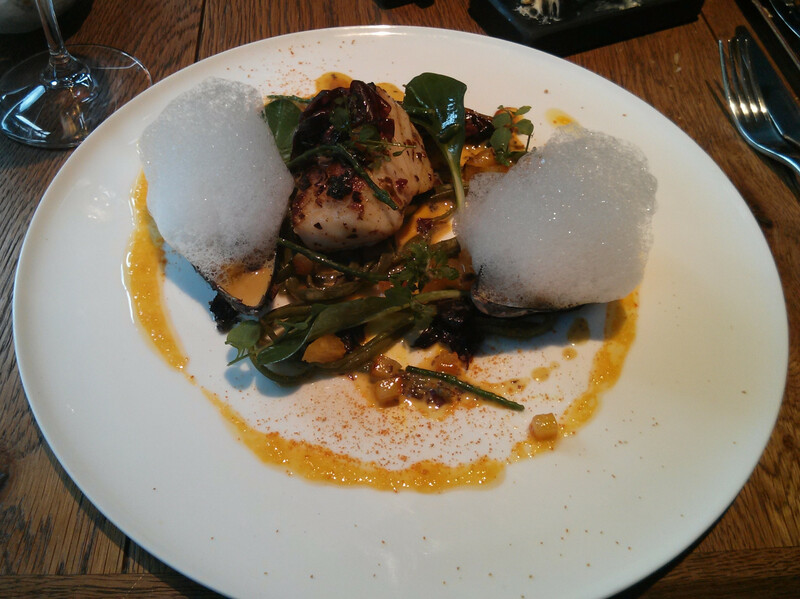 My main was cod, this came with 2 large mussels in shell with some sauce, covered by 2 huge clouds of foam. These were set within some endive and number of different seaweeds, and a confit orange sauce. The cod was of excellent quality and cooked perfectly, the mussels large and juicy, and both worked really well with the orange sauce. The seaweeds were really nice too, I enjoyed one in particular, crunchy long green strands like thick spaghetti which I think I've seen in the wild, but never knew was edible. My wife had an excellent onion dish, with baked onions, an onion half filled with gruyere custard, onion puree and an onion boullion. There were some good flavours here with superb caramelised onions, rich, creamy Gruyere and sweet puree. Desserts were really special, my dish of coconut and mango featuring a whole plate of delicious things, coconut ravioli, parfait, mousses, gels, powder and sorbets, a large piece of absolutely top notch mango, mango gel strings stuffed with tapioca, white chocolate filled with mango ice cream, and other bits. 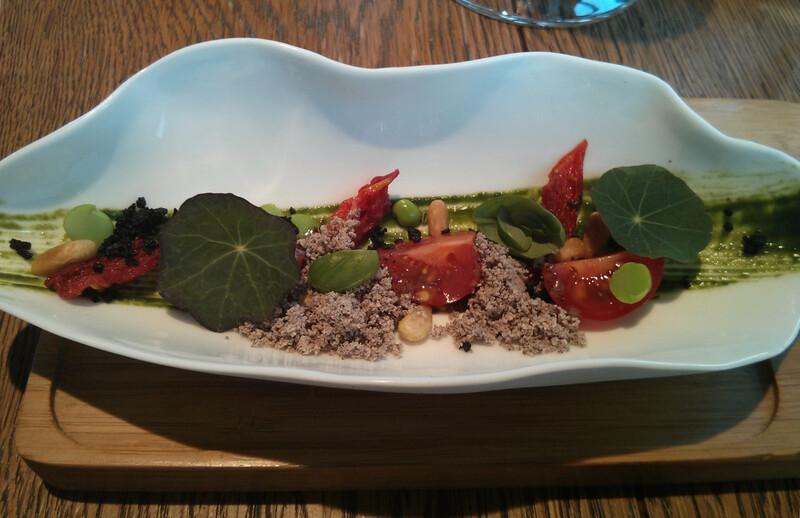 I loved this dish, every single part was delicious, and no flavours lost in the complexity and presentation. 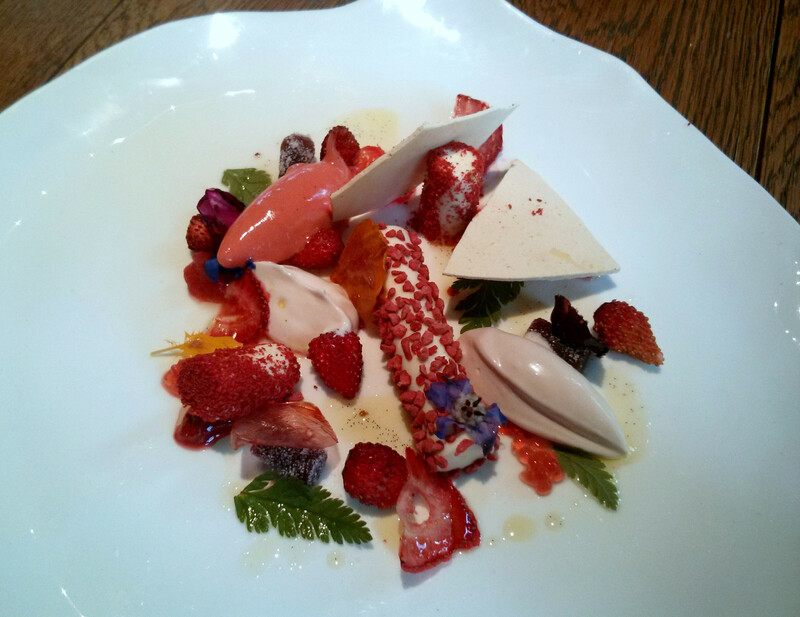 My wife's strawberry dish was stunning, and again featured a complex mix of fresh wild and dried strawberrys, jellies, mousse, sorbet and ice cream and some candied flowers. Both were exceptional desserts, both in technical ability and taste. A huge selection of petit fours accompanied coffee, a jar containing whisky and lemon and basil jellies, a selection of red fruit meringues, peppermint meringues, miniature cheesecakes, lemon and basil macarons. There was also a wooden bowl with some chocolate and nut caramel tuiles and ganache. Again some really top quality work from the pastry section, other than the whisky jellies which aren't my thing, all were polished off in short order. The bill, hidden within an interesting old cookery book from the fifties, came to £218, including 2 glasses of rose champagne to start, and a glass of white and red with the main course. 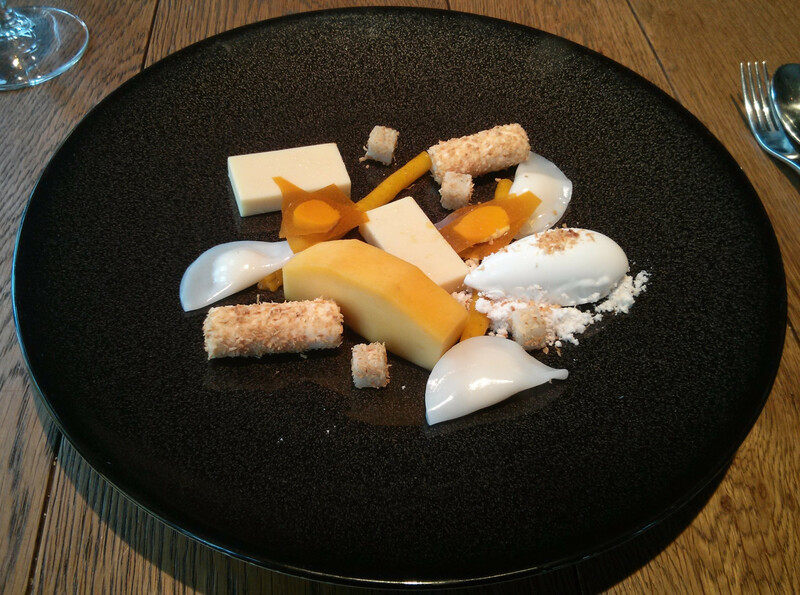 I really like Tom Aikens food, his style highly technical, innovative and complex but with plenty of excellent flavour combinations that result in some excellent dishes. Clever, complex and unusual vegetarian options are available, I am keen to return to sample more. Char grilled and baked celeriac.